Now this is a book. This a 'must have' book for anyone that is interested in the history and origins of association football in the Republic of Ireland. Packed with Irish football information, figures, statistics, and photos this wonderful volume should be all Irish soccer fans' collections. The author, Donal Cullen, has described this as a labour of love and it surely must have been. The research involved in producing Freestaters must have been painstaking and tedious and clearly Cullen stuck assiduously to his task to produce this encyclopaedia of Irish football from the creation of the State up until the second World War. Find out why this little of Ireland has two separate international teams when pretty much every other sport in Ireland is unified. Learn why the split happened and how events unfolded. What teams formed the very first League of Ireland and who won the inaugural league title? Who has the historical distinction of scoring the first goal in League of Ireland match? Who provided the opposition for the first international outing for the fledgling Irish Free State? What was the result of the match? Who scored the first international goal for the 26 counties? 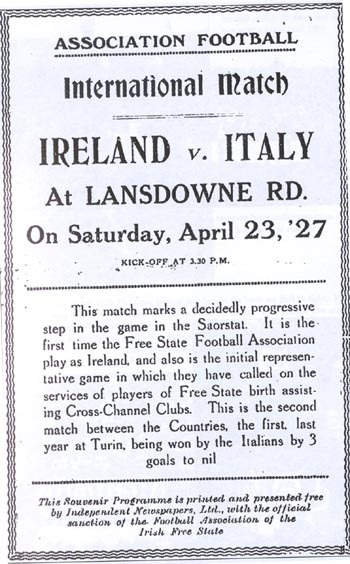 Read about the bizarre situation when player could, and did, play for both Irelands and sometimes playing the same opposition for both Irelands within days of each other. When did the Freestaters record their first international victory and who did they beat? Who played for Ireland on the day? Which Ireland footballer has a goals-to-game ratio of 87%? When did Ireland begin playing English-based in Irish international matches? Find out about forgotten teams such as Bray Unknowns, Fordsons, Pioneers, Olympia, and Midland Athletic. An amateur international football match against the USA at Dalymount Park in 1924. 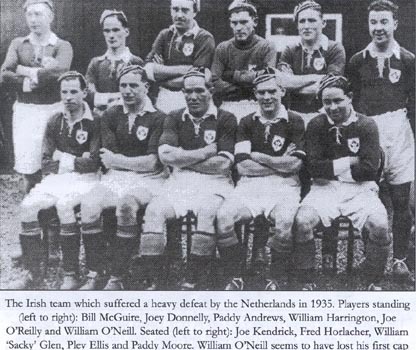 Players standing (left to right) Johnny Murray, Paddy Duncan, Tommy Muldoon, Frank Collins, Charlie Dowdall, Tony Hunston. 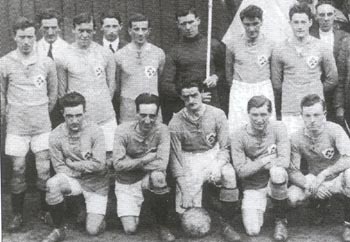 Players kneeling (left to right) Mickey Farrell, Nick Brooks, Bertie Kerr (Captain), Tom Murphy, John Thomas. On the day the the Irish team wore blue shirts with shamrock crest. The Free State won the match 3-0 having led 2-0 at half time. Ned Brooks scored a hat trick in Ireland's first match in Dublin. The first Irish international hat trick. The attendance in Dalymount on the day was 5,000 and gate receipts were £240. The USA team was returning home to America following participation in the 1924 Paris Olympics. Donal Cullen's book Freestaters is a regular treasure trove of Irish football nostalgia and history. Following extensive research Cullen has produced a gem that is an excellent read and is also an outstanding reference book. Freestaters has quite detailed statistical information at the back of the book that includes, a full list of players, capped by the Free State FA, appearances, goals scored, club teams they played for, details on players that played for both 'Irelands', match results, dates and venues of matches, attendance records, and much, much more. Freestaters: The Republic of Ireland Soccer Team 1921-1939 is highly recommended however it can only be purchased online from the publishers, Desert Island Books. I had problems with Desert Island eBay shop so I had to deal with them via email. Donal Cullen was born in Raheny, Dublin in 1962. He had no more than a passing interest in soccer until he became hooked on Dutch 'total football' in the 1974 World Cup. Seeing the Republic of Ireland in action for the first time sparked his addiction to the facts and figures of the national team. His first book Ireland: On the Ball, was published in 1993 and quickly became an indispensable source for Irish soccer historians. Donal is married to Denise and they have a daughter, Grace. He has many interests outside sport: he has performed a solo parachute jump and proudly owns a copy of the greatest movie ever made, Miller's Crossing, signed by Gabriel Byrne. He is currently working on further histories of Irish soccer.